I took the last couple of days off. 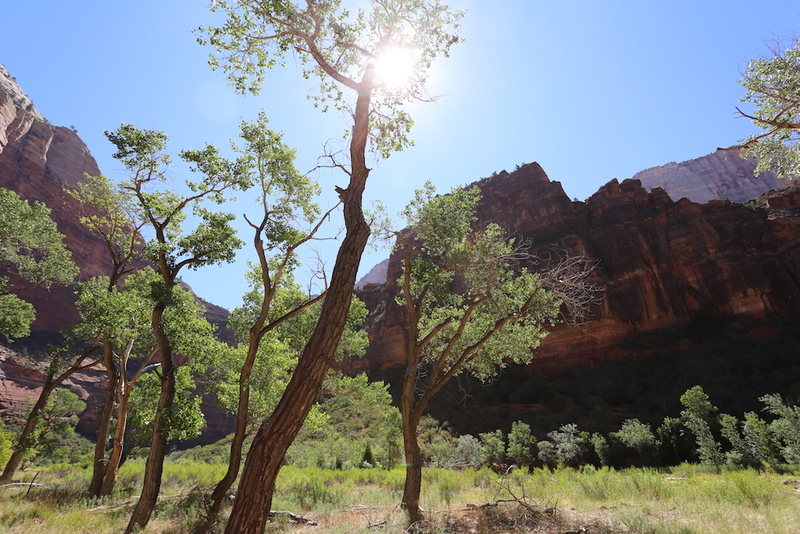 I spent one day in Cedar City, uploading my posts for the two previous days, then just relaxing. Another day I drove down to St. George and spent most of the day there. I ended up going to a pawn shop and buying a guitar so that hopefully I can force myself to learn how to play with all this free time I’ve been having in the afternoons. I’ve been buying guitars for 12 years, always telling myself I need to learn, then never actually learning, and eventually selling the guitar or giving it away. I’m hoping this time will be different… we’ll see. 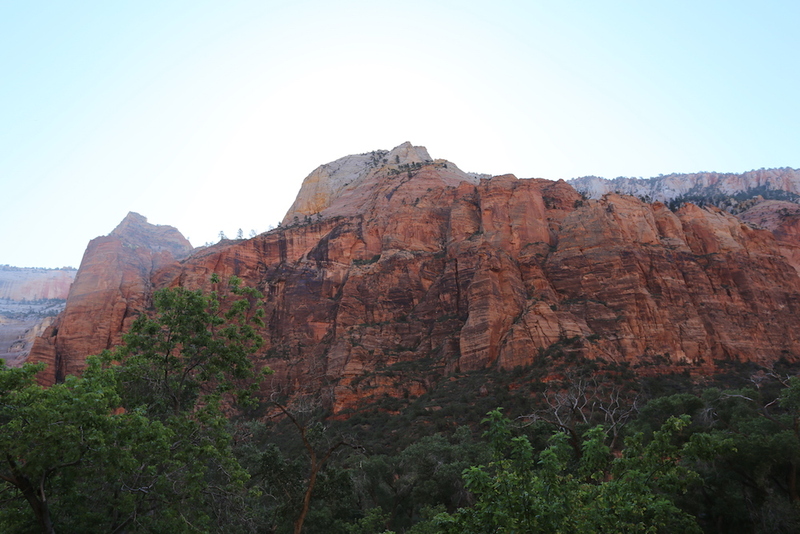 Last night I decided I was gonna hit up Zion in the morning and so that is exactly what I did. 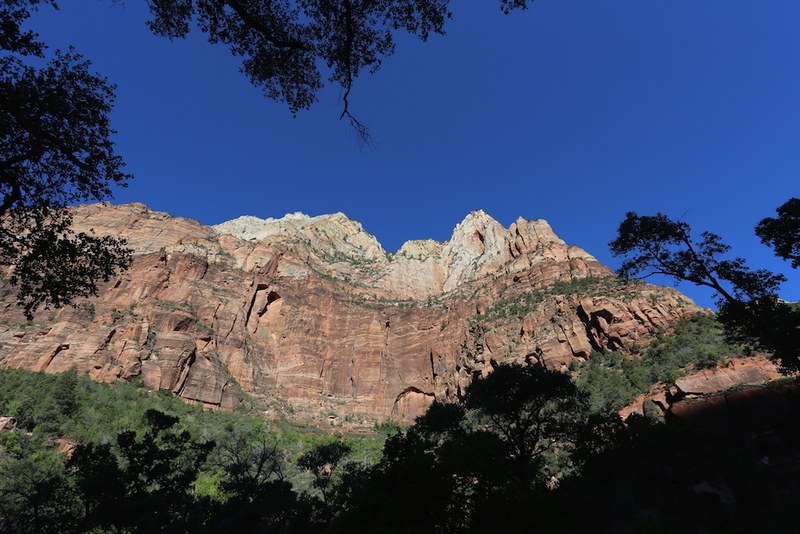 Being that Zion is one of the more popular parks in Utah, I knew I needed to get there early to beat the traffic. 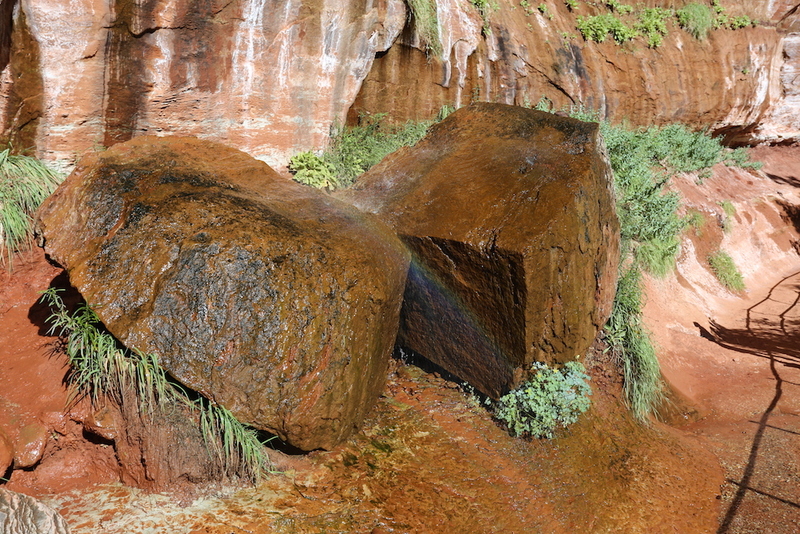 I woke up shortly after 6:30 this morning and headed directly for the park, which is only about an hour Northeast of St. George. Since I got there before the visitor center even opened, there was plenty of parking available. 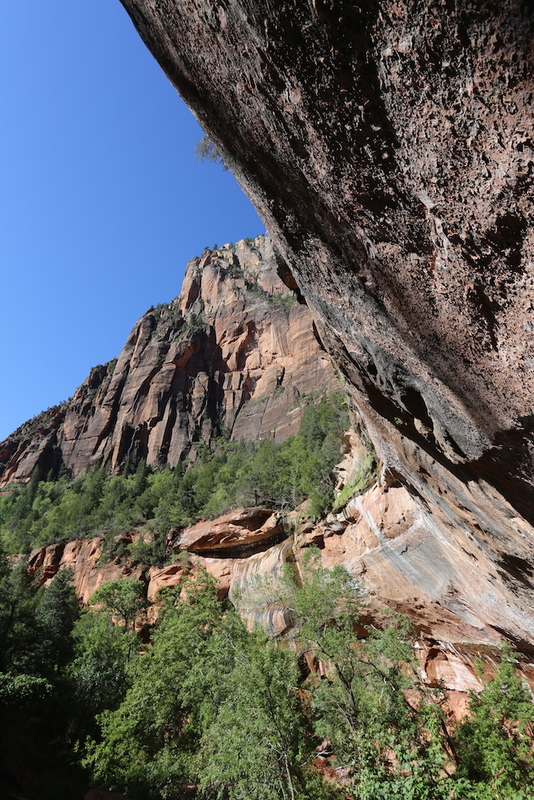 Zion is quite different from the other parks I’ve been to so far. In my opinion, they have a much better system in place to manage traffic and congestion. Most of the park you’re not allowed to drive private vehicles on without a special permit, unless it’s after October 25th. Instead, they have a free shuttle service that continuously drives through the park and you just get on and off at whatever stop you want. They say a shuttle comes by almost every 15 minutes, but I never had to wait more than five minutes. What I loved the most was that I didn’t have to fight for parking at each stop and I wasn’t using any gas to get around the park, which means I save money. I wish all the parks had a system like this, especially Yellowstone. 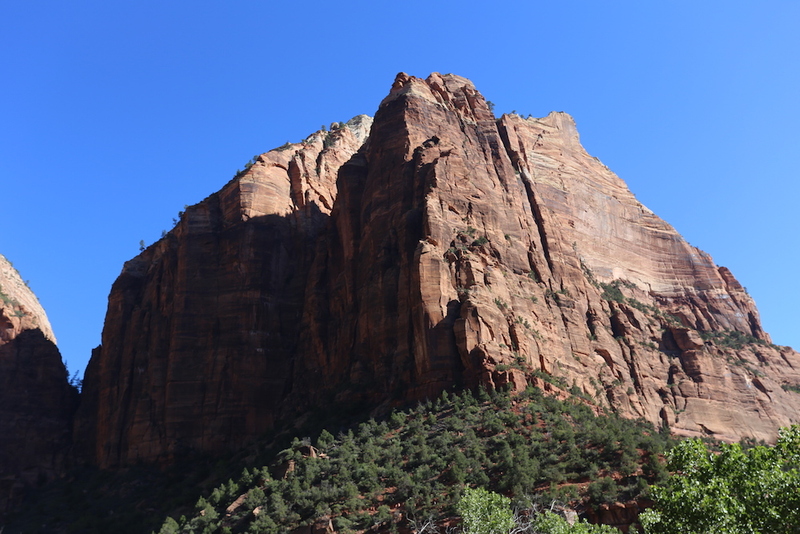 Since I had never been to Zion before and honestly knew almost nothing about it, I decided to take an easy day and focus on simple hikes and exploring the majority of the park to decide where I wanted to spend more time. 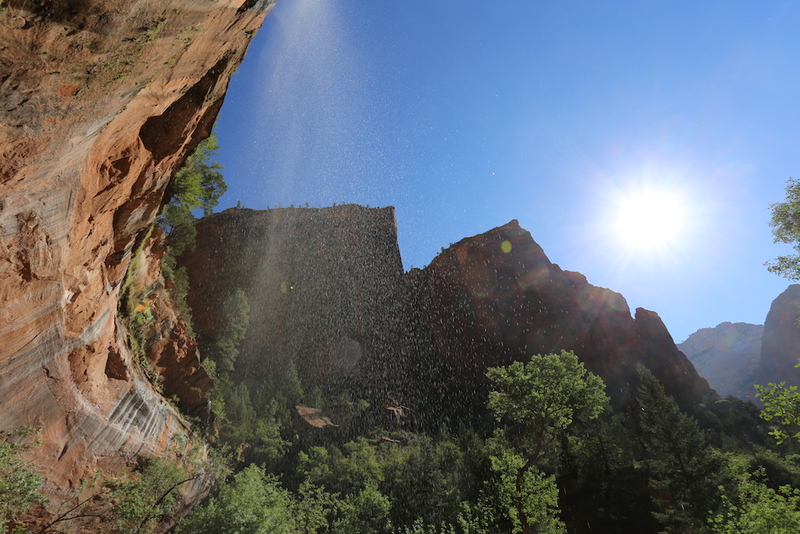 My first stop was at the Emerald Pools Trails. There’s a Lower Pool, Middle Pool, and an Upper Pool. 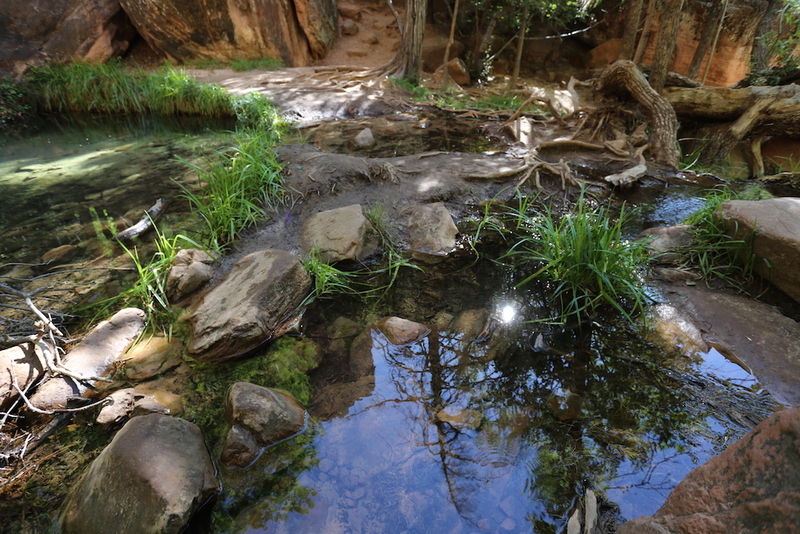 The Lower Pool has a lightly trickling waterfall that the trail goes behind, which is pretty cool. 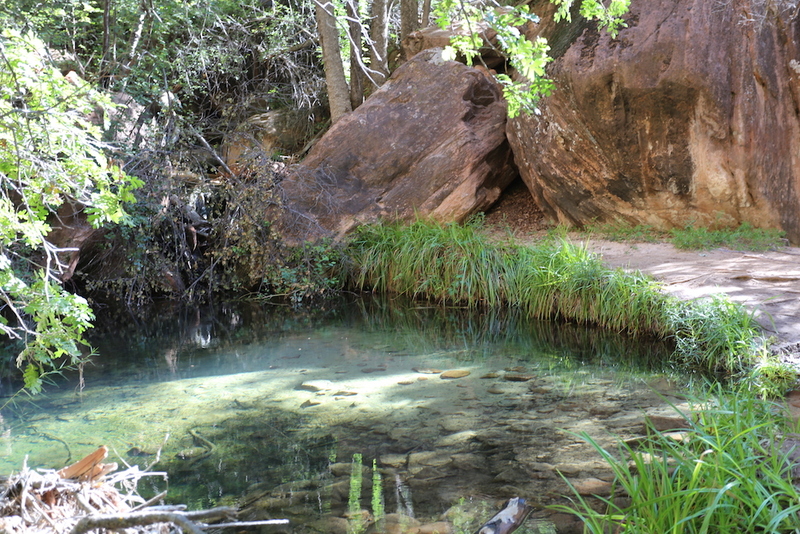 Altogether, it’s a 2.2 mile, round-trip, hike to see all the pools. 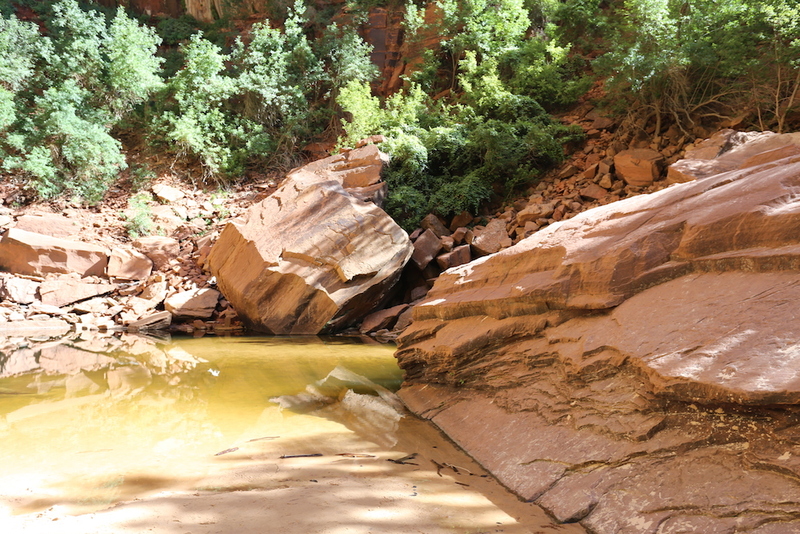 On the way down from the pools, I decided to take the mile long Kayenta Trail over to the next shuttle stop and just get picked up from there. 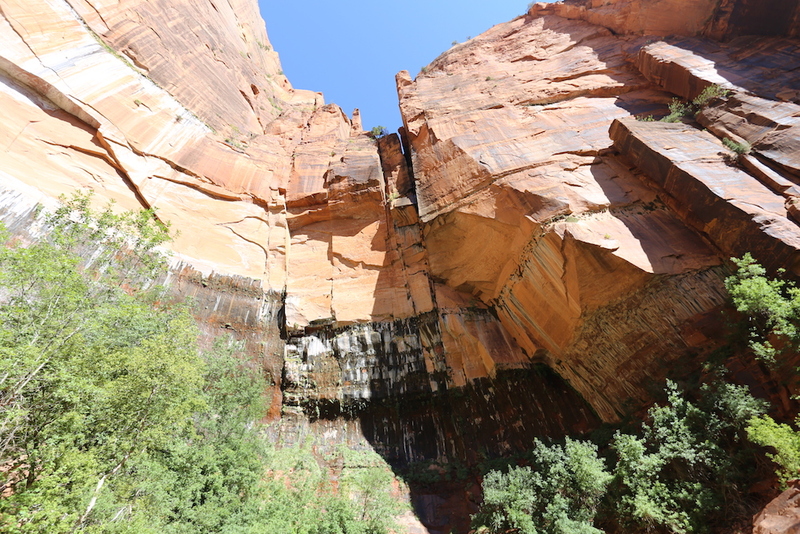 From where the Kayenta Trail ends, you can jump onto the West Rim Trail to connect up with the Angels Landing Trail, a steep, narrow ridge to the summit that is not recommended for people who are afraid of heights. I skipped it for today due to the length of it, but I wanna hike it either tomorrow or the next day, depending on what else I try to cram into the day. 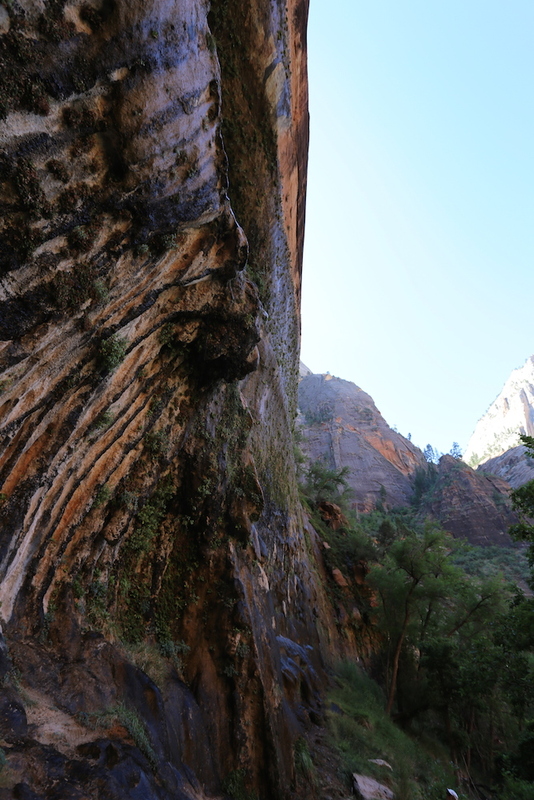 I jumped back on the shuttle and headed up to Weeping Rock. 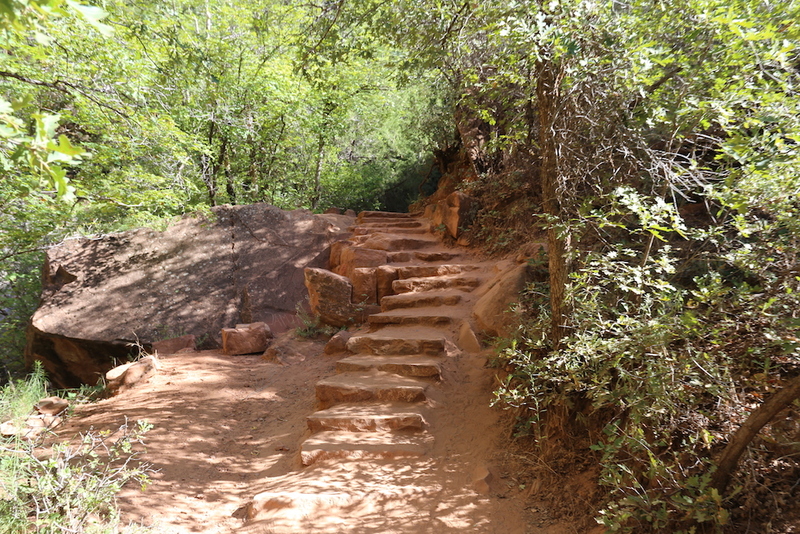 It’s a very short (0.4 mile, round-trip) hike. 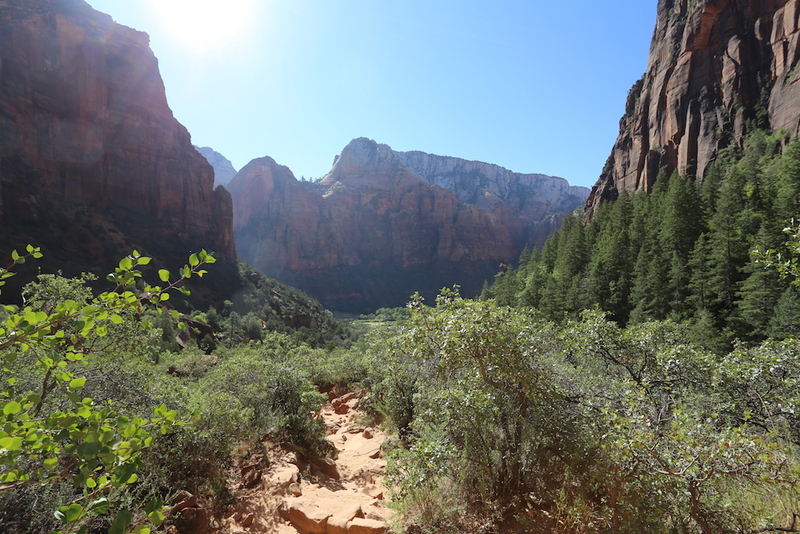 This is also the location to hike up the East Rim Trail, which has the Hidden Canyon Trail connected to it. 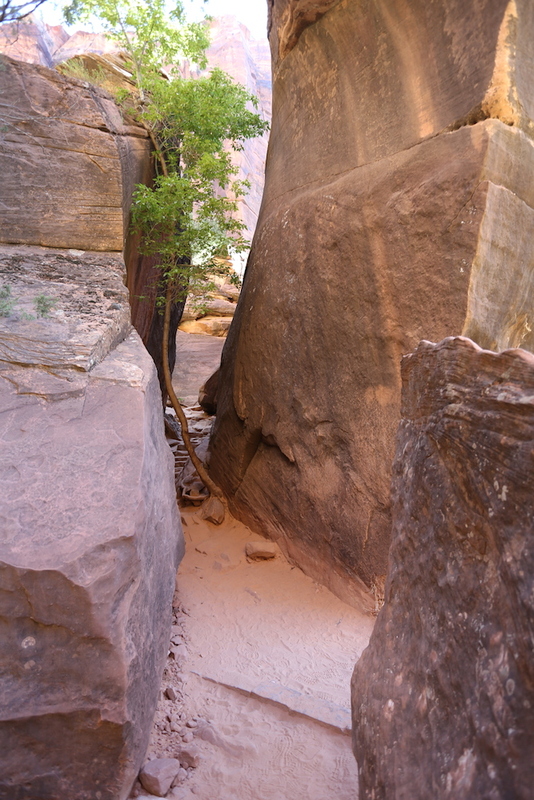 I wanted to hike the Hidden Canyon, but apparently it’s closed this year for construction. 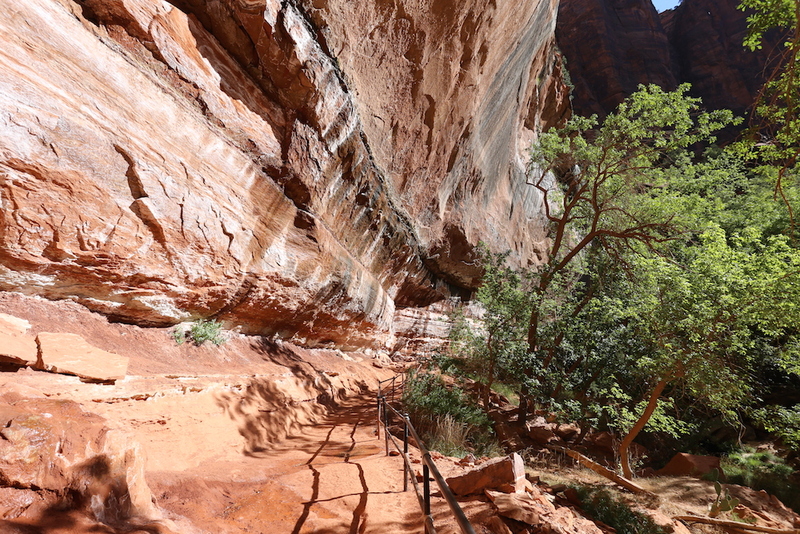 I know at least part of the trail has a narrow ledge on the side of a cliff that has chains anchored into the cliffside for safety. Sounds awesome, right?! But, alas, I’ll have to come back here a different year to do that one. 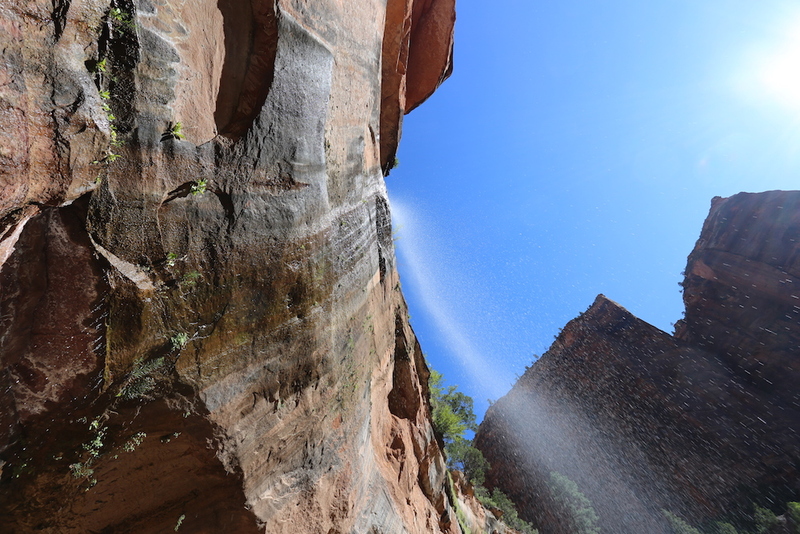 Most of the pictures I took at Weeping Rock didn’t come out or I didn’t like them. 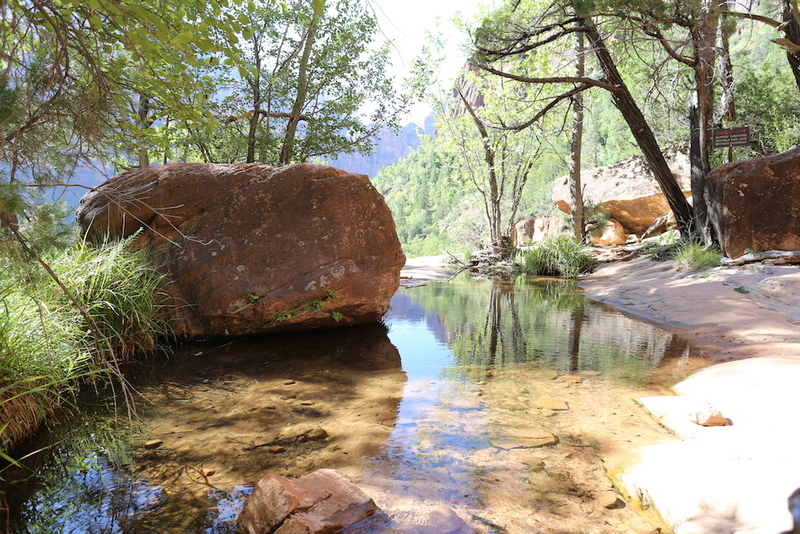 Next stop was Big Bend, shortly up the road. 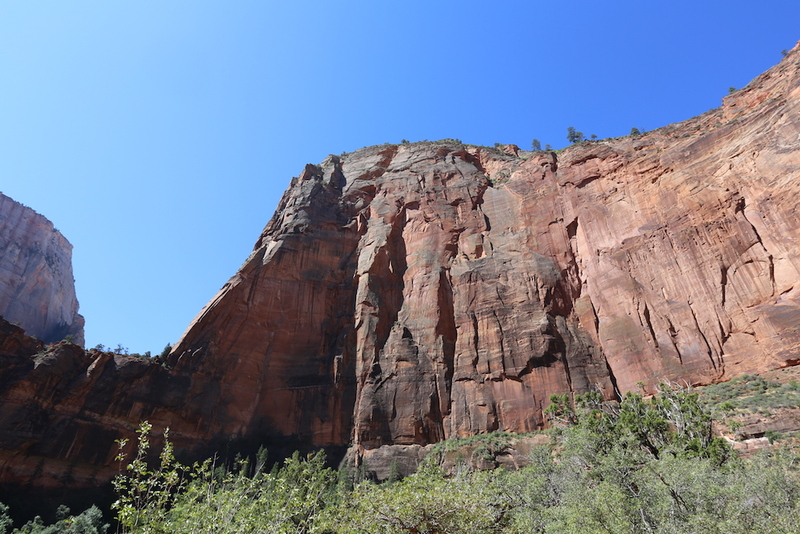 It’s just a bend in the river, but it gives you a view of Angels Landing from the ground level and a couple other formations. I hiked down to the river area and followed an unmarked path for a short while, snapping up a few pictures along the way. I really love the one with the trees. 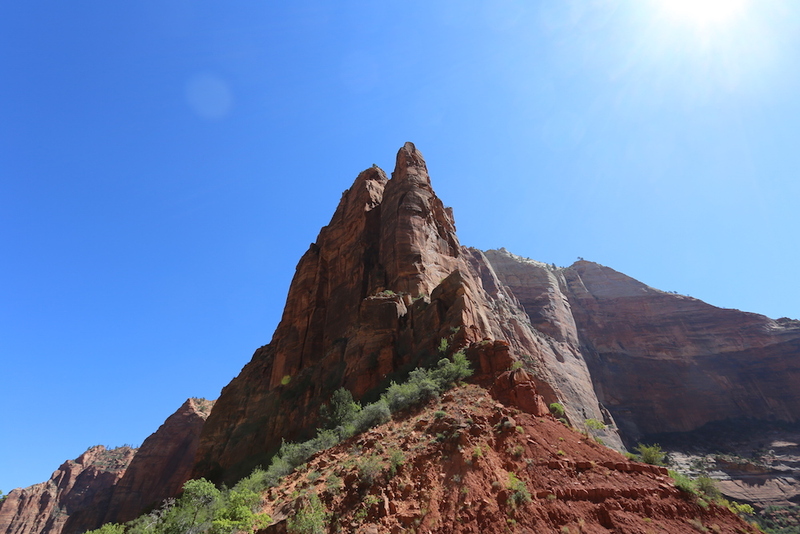 Then I headed up to the Temple of Sinawava, the last shuttle stop on the Zion Canyon road. 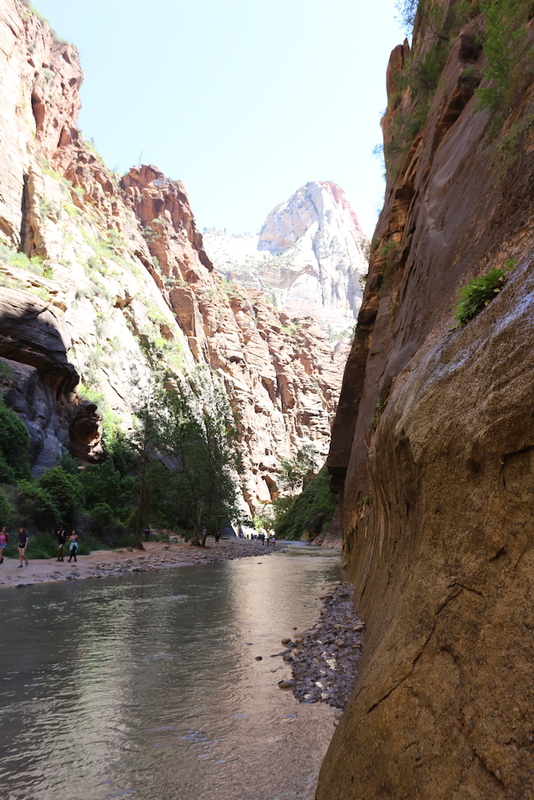 There’s a two mile, round-trip, Riverside Walk that, as you may have guessed, follows the river into the canyons. 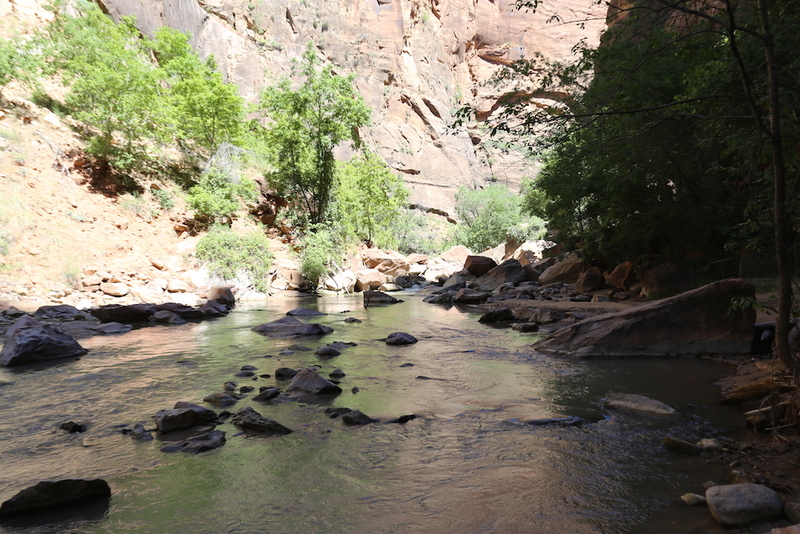 At the end of the walk you have two options: 1) Turn around, or 2) Continue on by walking in the river for the next five miles in what they call The Narrows. 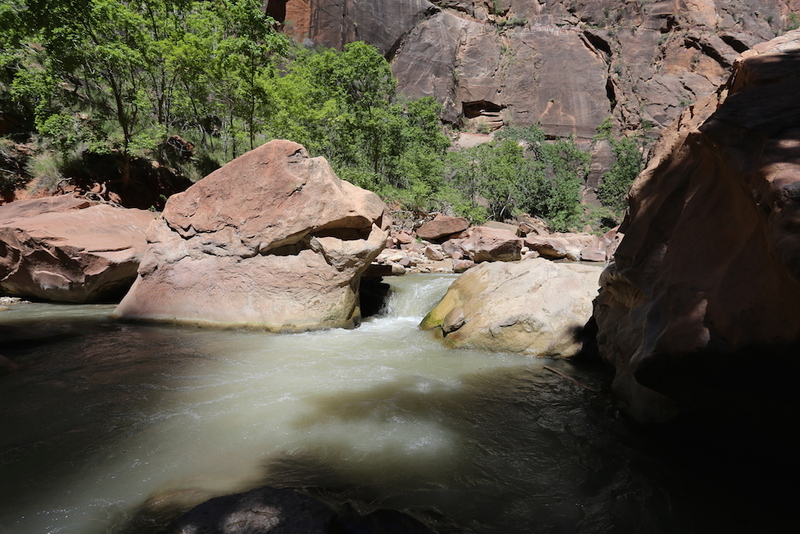 When I talked to the lady at the visitor center this morning, she said the water only gets about waist deep, but it’s important to pick the right day to go, as there’s a risk of flash floods any time it rains. This is a hike I want to do for the pictures, but hiking 10 miles today just wasn’t the goal. 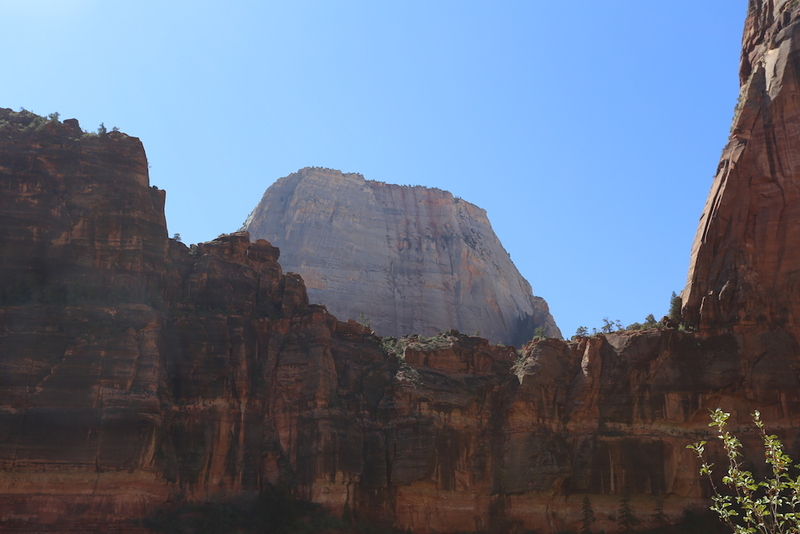 My last stop for the day was back towards the front of the park at the Court of the Patriarchs. I missed the stop on the way up. 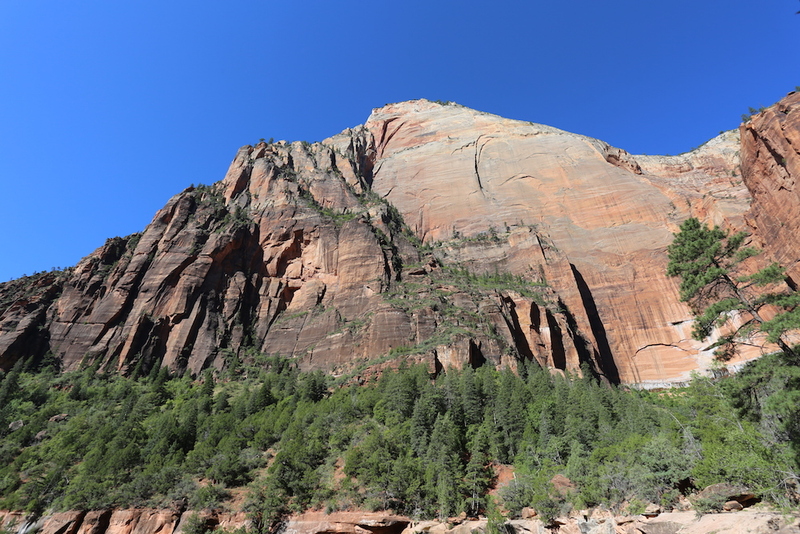 It’s a quick stop with a short hike up to an overlook area to get pictures of “The Patriarchs”, which are three large peaks grouped together. Now that I have an idea of the park, I know where I want to focus some more time. 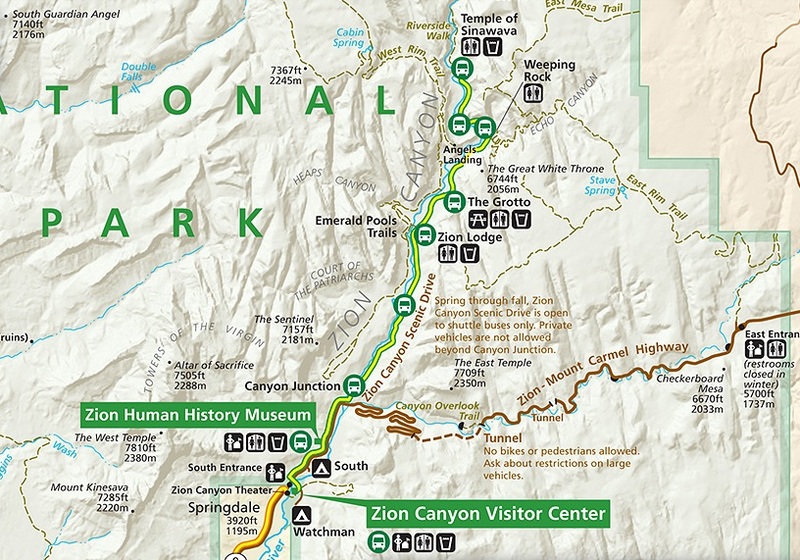 I definitely want to hike the Angels Landing Trail, as well as three trails accessible at the visitor center area, I’d like to hike the Narrows, and I want to drive the Mount Carmel Highway that connects the Zion Canyon section of the park to the East side and has a 1.1 mile long tunnel in the middle of it. I’ll probably spend three or four days here to do it all. 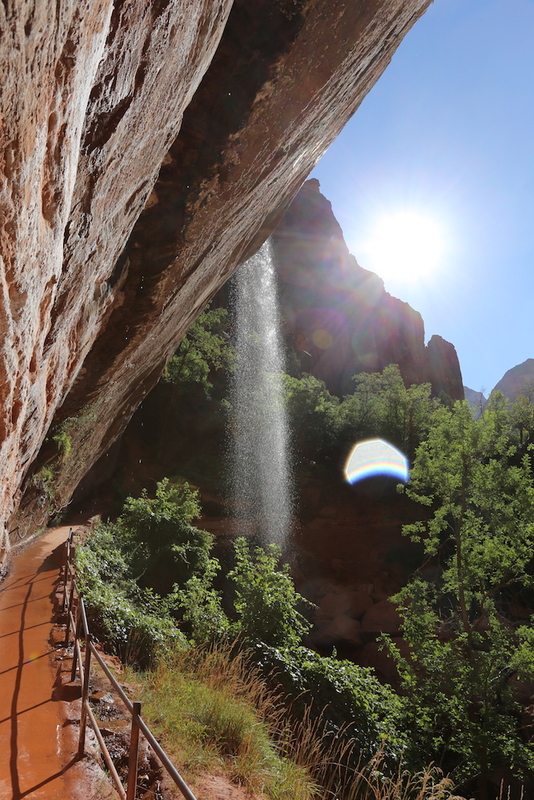 I’m WAY ahead of schedule and even after I hang out in Zion for a few days, I have almost 20 days before I need to be in San Diego to meet up with Szilvia for the next portion of this adventure. I haven’t decided what to do with that free time yet or where to go.